Flèche Wallonne comes sandwiched between Amstel Gold and Liége-Bastogne-Liége during this week of hectic and stressful racing through the Ardennes region. It takes more than a gutsy ride of sheer will power to win Flèche Wallonne, this race sees a small group of specialist riders earmarked to duke out the finish atop the infamous Mur de Huy. It is on these ruthless slopes where the real contenders are soon separated from the pretenders as they wrestle against the gradient and fight for position in order to make the final selection in this unique race. Placed anywhere else in the calendar would likely have made Flèche Wallonne a classic, but being bookended by the seemingly more prestigious Amstel Gold and the monument that is Liége-Bastogne-Liége has seen its profile diminished somewhat. Riders will hope to capitalise upon the previous weekend’s efforts and the distracting allure of the following Sunday’s eye-catching monument, as a way to cause a stir on this herculean finish and win against the odds. From the start in Waremme, the peloton are tasked with completing a total of 205.5km in order to reach the summit of the race deciding Mur de Huy. Attention is suitably focused upon the Mur de Huy when planning the best method of attack in order to win here, the riders will have several opportunities to gauge the climb as it features twice on the race profile before acting as the backdrop to the race’s outcome. Like many one day races, the riding opens with several kilometres of gently rolling terrain as a warm up to the chaotic battle which is bound to ensue once the climbs begin getting ticked off by the pack. Only one climb is present during the first 92km of racing(Cote des 36 Tournants), allowing a breakaway to establish at the front of affairs before pressure begins ramping up as the remaining 9 climbs start approaching thick and fast. The true race opens up with the 1km Cote de Bellaire (avg 6.3%) at the 92km marker, followed swiftly by the longer Cote de Bohisseau which as a 5.5% average gradient over its 2.4km of ascending. By this point in the race, some within the peloton might believe they are gaining a level of insight as to their condition for the race; this will soon be tested as they hit the first ascent of the Mur de Huy after 118km of racing. If the legs are feeling ropey from the opening half of this race on the first pass of the Mur de Huy, the chances of them coming round to contest the finish is extremely unlikely. Acting as a mid-race reconnaissance, this opportunity will refresh the memory of the more experienced riders and see race favourites begin visualising their schemes for the finale. Turning away from Huy onto an almost 6okm circuit will take the peloton on an excursion to discover three further climbs which they are expected to get the beating of en route to a possible Ardennes victory. First comes Cote d’Ereffe (2.1km, avg 5%), before heading into familiar territory with another pass of Cote de Bellaire and Cote de Bohisseau as they tick the mileage over to just shy of 160km at this point; with the second ascent of the Mur de Huy after 176.5km to be completed. 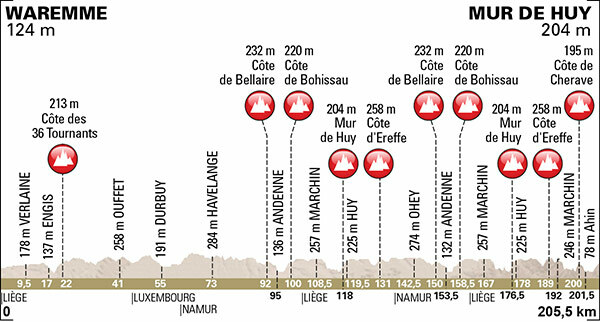 The remaining 29km is composed of only three climbs, including the final ascent of the decisive Mur de Huy. Though the favourites are still likely to be in contention at this point of the race, a clear amount of thinning will have occurred amongst the peloton by now; possibly leaving major names isolated from their teammates. Cote d’Ereffe is the first of the afore mentioned three climbs which remain, just over two kilometres long and averaging out at a gradient of 5%, it does not standout as an aspect which will impact upon the race greatly, but you never can tell in a one day race such as this. With only 5.5km remaining the new addition of the Cote de Cherave could certainly cause problems for a peloton intent on setting the finish up for a sprint amongst the puncheurs. The climb itself is 1.3km long and sees an increase in steepness compared to its predecessor, this time possessing an average gradient of 8.1% which needs surviving before the last climb of the Mur de Huy. Perhaps it is the subsequent descent from the Cote de Cherave which will be more dangerous than the ascent itself, offering any escapees a solid springboard in their attempts to rob the favourites of the finish they desire. As we have already seen at Amstel Gold during the finale upon the Cauberg, the imperative for the major players will be staying safe and maintaing a strong position in order to defend or attack from. By now, the peloton will be all too aware of how hard life gets beyond the Mur de Huy’s average of 9.6%; in fact the win will be fought for on ramps hitting 25%. It is with this in mind that it becomes obvious how underrated a champion of Flèche Wallonne can be compared to the other races in the Ardennes this week. To win this at the death will require a canny rider to conserve energy and be smart enough to find daylight before striking for home with a monumental effort over the gruelling 25% section up to the line. Once again Alejandro Valverde enters the day as race favourite after a great showing at Amstel Gold where he found only Michal Kwiatkowski in finer form than himself this year. As mentioned when analysing his hopes of taking Amstel Gold last week, Valverde has not come into this week of races with the level of victories many expected him to have by now; many of his missed opportunities thus far have been the result of misfortune rather than fitness however. He looked calm when boxed in at the base of the Cauberg on Sunday and smoothly worked his way into a better position before striking from the decisive group to take the young Pole to the line in the sprint. The uphill finish which maxes out at 25% suits Valverde nicely, a man who has form when it comes to securing one day and grand tour victories over similar terrain; let us not forget that he is the defending champion here. He has clearly raised a few eyebrows with his condition in the first race of the Ardennes and should be the man to beat on the Mur de Huy. Last year saw Dan Martin beaten into second place by a deadly Valverde and there is no clear reason to suggest he cannot be the man to push the Spaniard to the line once again. He recorded a solid 15th placing in Amstel Gold and has the ability to flourish on this terrain as already witnessed at Flèche Wallonne last year. Not only will he like the finish, but Martin has a an enviable record in one day races and classics which will reenforce his claims here. Martin’s history at this race in particular is impressive, having previously finished 6th, 4th and 2nd in his previous three consecutive appearances. If he can stay out of trouble and find the right wheel to follow on the Mur de Huy, he has everything in his toolbox to dismantle the chnaes of Valverde and add another major one day race to his palmares. Katusha arrive here with two previous winners in their ranks, the Spanish pairing of Joaquim Rodriguez and Daniel Moreno; champions in 2012 and 2013 respectively. Rodriguez did not have a great time of it at Amstel Gold, finishing in the middle of the pack despite looking good in the latter stages of the race. His form at the Vuelta al Pais Vasco is an encouraging sign for him in the face of a disappointing Amstel Gold result and clearly copes with this finish as a former winner. Like his compatriot Valverde, Rodriguez seems to function best on the hellish gradients of a finale which leaves many withering in the wake of his big efforts. Such an ability has really only seen Valverde as his main rival in this type of uphill finish and will be well worth watching ahead of the final climb up the Mur de Huy. Katusha’s second former winner is Daniel Moreno, a man who currently appears bereft of the form which previously delivered him the title here. Given this factor, it will be expected of Moreno to help leader Rodriguez with his tilt at the win, but he will remain a positive backup plan if required. He goes well on this terrain and is certainly one of the faster finishers if he does not burn out too soon on the climb to the finish line. Second to Moreno when he won in 2013 was Colombian Sergio Henao, the punchy finisher is riding as the best hope for Team Sky at Fléche Wallonne this year. He clearly has the ability to perform well upon the Mur de Huy, but possibly lacks the nous required to launch a race winning move from the right position. The Colombian looked far from his best during Amstel Gold, but this occasion suits him much better and he will benefit from a shorter and less stressful race for the most part. Timing will be everything for him; get it right and he could certainly podium at the minimum. Chris Froome is an interesting presence amongst the peloton at this race for Sky too, a dark horse who could step up and take leadership if required; no doubt causing a big stir amongst the major names if so. Though he lacks the ability to finish as fast as the likes of Valverde, Rodriguez or Martin on these 25% ramps; he could attack much earlier on the Mur de Huy in order to compensate. We have witnessed the incredible tempo Froome can set on an incline and his spiked efforts have the ability to open a large gap rapidly. If he did choose to attempt this, a gap which is too great to close on such a sharp finish would only require Froome to hold out until the line greets him atop the Mur de Huy. Michal Kwiatkowski struck gold last weekend and finally took his first Ardennes win after having demonstrated amazing consistency at the races over the last couple of years. He stayed in contention during Amstel Gold’s final climb of the Cauberg and benefited from the regrouping which occurred after a hesitant attack by Philippe Gilbert and Michael Matthews. Though the Polish rider does have the attributes of a puncheur style rider, the finish of the Mur de Huy is probably a step too far for him; at this point in his career at least. Last year he managed a very impressive third place behind Valverde and Martin and a 5th place in 2013 too. Sunday’s performance would suggest that form is returning to Kwaitkowski and he should be part of the diminished group which begins the Mur de Huy for the last time, but he is probably destined to be distanced once 25% gradients hit home. Yet another former winner which lines up at Flèche Wallonne is Ardennes specialist Philippe Gilbert, but he comes far down this preview for good reason. When he did win this race in 2011 it was a shock to both pundit and rider, as Flèche Wallonne was viewed as the race he was least likely to add to his palmares in this region. Obviously 2011 was incredible for the Belgian, as he won the Ardennes’ triple crown and went onwards to become World Champion upon the same Cauberg which also secured him Amstel Gold. In 2015 it seems a hard task to argue in favour of Gilbert taking his second win here, as the field offers a depth of talent which suits the concluding terrain much better than the Belgian rider. A young face no doubt eager to make his presence felt here will be British rider Simon Yates who has been handed joint leadership (with Michael Albasini) in order to have a stab at this race. Vuelta al Pais Vasco proved that Yates is in fine condition heading into this race and probably should have walked away with a win on stage 4. His issue could be hesitating when he really needs to commit to a move wholeheartedly, waiting continuously for the ‘perfect moment’ can be an infinite affair, but if Yates gives everyone both barrels from a good position on the Mur de Huy it will take a strong effort to reel him back. Bauke Mollema has a consistent recored here, finishing in the top ten or thereabouts on several occasions already. So far this year encouraging signs have been apparent when riding Tirreno-Adriatico and Vuelta al Pais Vasco, but he is yet to crown these showings with a win. He suits this race reasonably well and appears to be the best bet for Trek Factory Racing at this edition, but will find it very difficult to get the beating of the faster finishing men. Outsiders are plentiful at this edition of the Flèche Wallone and one such man who could cause an upset is Astana’s Jakob Fuglsang. He was in a late move with Greg Van Avermaet during Amstel Gold which failed due to the Belgian’s presence, but the Dane walked away adamant that he could have taken it to the line had he not found Avermaet on his wheel. He evidently believes himself to be in good condition, but will struggle for freedom in a team which includes Vincenzo Nibal, Michele Scarponi and Rein Taaramäe to name a few. If he attacks early on the penultimate climb with approximately 5km remaining, he definitely has the guts to push such an effort to the limit in search of Ardennes glory. One which few will tout as a contender is Rafael Valls, the Lampre-Merida rider who is likely to find his presence here at the disposal of team leader Rui Costa. Costa will take command after a solid finish at Amstel Gold, which is sure to have a detrimental effect upon the chances of the Spanish rider making a move. However, Valls has looked strong this season thus far, particularly on sharp uphill finishes which include winning atop Green Mountain in Oman and mixing it with the best climbers at Paris-Nice. Should he be allowed to get away by leader Costa, the peloton might regret letting him slip off the front late on in the race when realising they are then tasked with catching him upon the Mur de Huy. Posted on April 21, 2015 April 21, 2015 by Spokenforks	This entry was posted in Classics, News and tagged 2015, Alejandro Valverde, Bauke Mollema, Chris Froome, Dan Martin, Daniel Moreno, Flèche Wallonne, Jakob Fuglslang, Joaquim Rodriguez, Michal Kwiatkowski, Mur de Huy, Philippe Gilbert, Race Preview, Rafael Valls, Sergio Henao, Simon Yates. Bookmark the permalink.